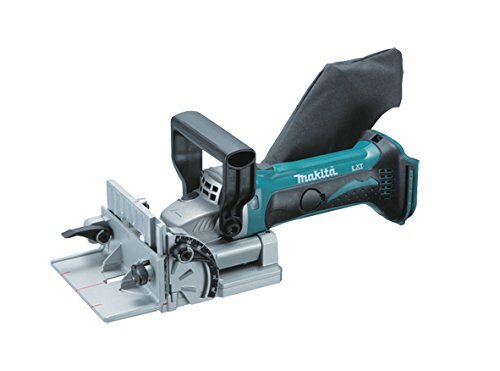 Makita DPJ180Z 18v Biscuit Jointer Body Only has the same easy-to-grip slim motor housing as used for model BGA452, it has a rotatable dust nozzle for easy connection to dust extraction. Features an anti restart function with a warning lamp. Shaft lock for easy blade change. 6 preset cutting depths. Electronic current limiter for overload protection (with warning lamp). Angle adjustable fence with positive stops at 0º, 45º and 90º. Blade cover can be opened with clamp screws for easy blade change. Body only machine.